Another of Joss Wheldon’s favourite episodes as this week we see the return of Vampire Willow a a character he seemingly liked so much that he wrote the episode specifically to bring her character back with Anya still attempting to regain her powers after being made mortal following the events of “The Wish”. Now she hits upon the idea of pulling the destroyed necklace which was the source of her power from an alternative dimension recruiting Willow to help her perform the spell. However when Willow screws up the ritual the Vampire Willow is instead pulled into their dimension. Opening to Buffy getting ready for her Slayer testing while Willow continues to experiment with her growing powers which now extends to making pencils float though bizarrely for so much focus seemingly being put on this Slayer testing we don’t actually get to see any of it with the focus instead being placed on Willow who has started to feel that the group see her as being too predictable and boring. Meanwhile principle Snyder orders her to tutor one of the basketball team stars with the indication being heavily on her doing the work for him. Elsewhere Faith is now fully in league with the Mayor following their meeting at the end of the previous episode as she now sets about reporting any Scoobie activitiy to him, in particular Willows attempts to access his private files. The relationship between Faith and the Mayor I’ve always found to be one of the more interesting ones as even in these early days of their partnership its clear that its deeper than the connections he’s shared with any of his other followers such as Mr. Trick which were purely business based. Their relationship however has much more of a father / daughter feeling to it as he fills the absent father role in her life with this connection eased into things through the scene of him giving Faith her own apartment. Vampire Willow is a great character especially as she goes a lot deeper than just being the evil version of Willow, especially for those of us watching the series through again as she essentially embodies the traits which would be revealed as being in Willow as the series went on as seen here by Willow believing that her vampire counterpart is gay foreshadowing her discovery that she is gay in season 4 while her preferred leather based style of dress and love of torture in perhaps a looser nod can be linked to the joke she makes about her and Oz “playing mistress of pain”. 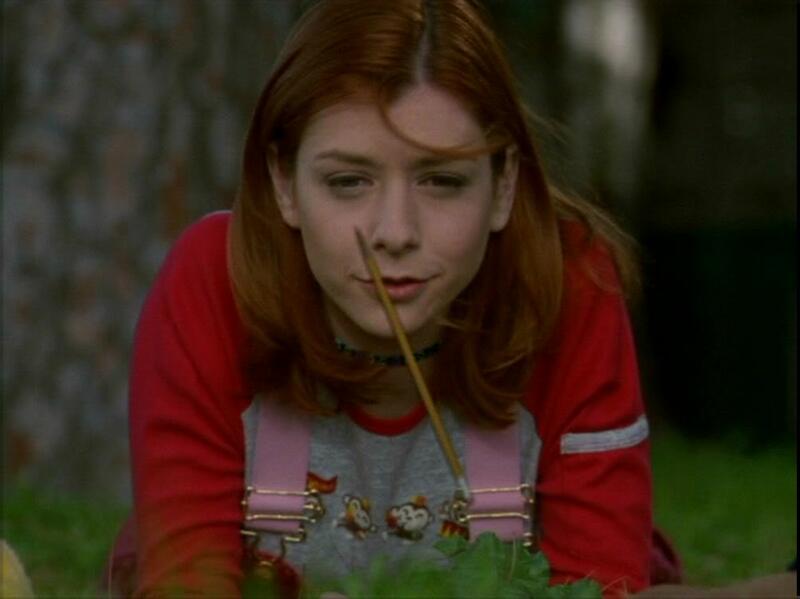 For the most part this episode is played largely for laughs as the usual mistaken identity episode marks are hit with Vampire Willow hitting the town and leaving Buffy and the Scoobies to believe that she had been turned unaware that she’s another dimensions Willow. The real strength of the episode however lies in just how convincingly that Alyson Hannigan is able to play the two characters especially when the two Willows are polar opposites to each other let alone being able to effortlessly project an air of danger and violence so that you know something nasty is going to happen to someone as soon as she utters “Bored Now” much like her other alter-ego “Dark Willow”. Another interesting thing I took away from this episode was that took away from this episode was the fact that Vampires can be knocked out by a tranquilizer gun! I’m still not sure why Willow doesn’t take this opportunity to just stake her evil counterpart seeing how she only shot her in self-defence. Nope instead Vamp Willow is locked in the Storage cage and left only for Cordelia to set her free in yet another case of mistaken identity (ho-ho). I wasn’t sure if this reluctance not kill her character off was down to Wheldon wanting to keep it open for her return again, only for him to then give her the “Poochy” death by returning her back to her own dimension in time for her to be staked. It’s strange that I remember liking this episode more when I first watched it and perhaps it was just my younger self enjoying a leather clad Willow more than what was happening in the plot and certainly without the foresight of how screwed up her character would become in the seasons ahead (a running trait of Hannigan’s work it would seem). That being said there are some fun humorous beats throughout and it’s good to see the show bounce back so quickly especially after last week’s misstep. At the same time Vampire Willow works just aswell outside of her vampire dimension and it’s fun to have her back again much like Anya whose appearance here while brief is none the less welcome as they slowly ease her into the group.